I’ve become whatever the female equivalent of the mamil (middle-aged man in lycra) is. I am obsessed with cycling. There’s been a lot of water under the bridge since my last cycling-related post exactly a year ago. At that point I was all set up on Zwift and enjoying riding my aluminum tri-bike regularly, noting improvements in strength and endurance. I was hooked, but it was early days. As usual my fitness program took a nosedive in July and August when the routine of the school year falls away and SVI work kicks into high gear, but with the exception of peak summer, I’ve been riding consistently, and hard. 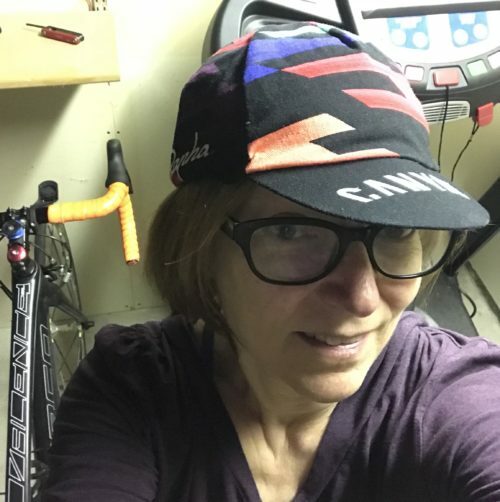 Although I did a bunch of fun big outdoor rides in the spring and late summer, the structured workouts and training programs I’ve done have been indoors. They have been based, as everything cycling is these days, around watts. My Stac trainer has a power meter which measures the work I’m putting out moment by moment and also allows me to derive the all-important FTP (functional threshold power), a measurement of the maximum watts I can average over an hour. Watts per kilogram of body weight is the most useful metric for estimating cycling performance potential. See how wonderfully geeky this is? A perfect fit for me! 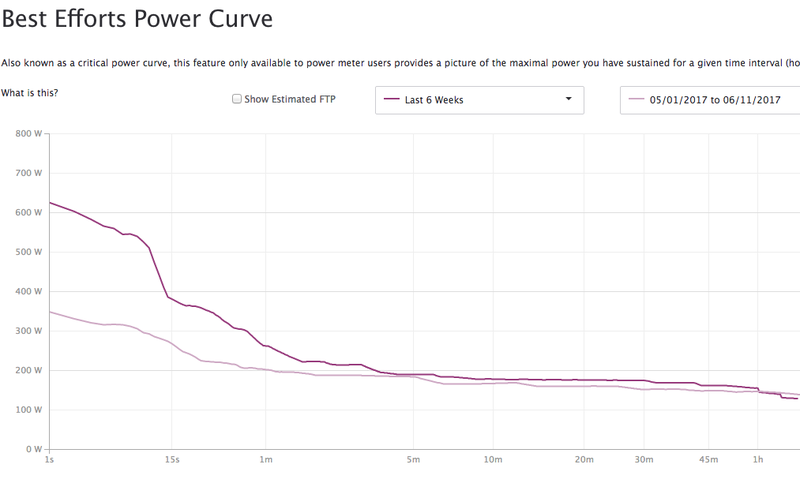 Power output now (dark purple) vs. 9 months ago (light purple). My biggest improvements in sprinting (high power, short duration) but there are other gains too. 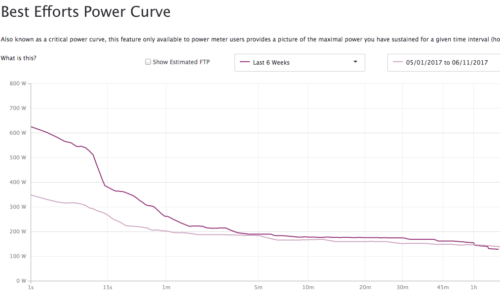 My FTP was about 130 watts when I started on Zwift, which at the time worked out to 2.24 w/kg. Now I’m at 176 watts, and being a bit lighter, that works out to 3.20 w/kg. This isn’t an amazing improvement compared to some people, as I was actually pretty fit when I started on the bike thanks to my running, but it’s a significant change. It has moved me from the lowest quartile among the Zwift women’s community to somewhere just above the middle overall. Which I figure isn’t bad for someone who is almost 55. I’ve done a 6-week beginner FTP improvement program, bits and pieces of a 12-week program, a ton of semi-competitive group rides and group workouts, a 6-week time-trial team challenge and I’m almost done a challenging 4-week FTP booster program for more advanced cyclists. The most fun though was the Zwift Women’s Academy program during September and October. For the really talented but as-yet-undiscovered cyclists, Zwift Academy gave them a shot at a spot on a pro team. But the larger group of lesser mortals were welcome to participate as well. The program had a series of prescribed workouts, as well as the requirement that you participate in a couple of races and a bunch of group workouts. The ratio of men to women on Zwift is probably still almost 10 to 1. There was a Zwift Men’s Academy running concurrently, but it didn’t get as much uptake: only about 4 times as many participants signed up in the Men’s Academy as the Women’s. And the men’s graduation rate was only half as high as the women’s (13% vs. 26%). There was some kind of magic at work amongst the women. The sense of community and mutual support that sprang up was pretty awesome and motivating. I earned my graduation cap and ZWA sparked my biggest improvements in power. I upgraded my bike last spring to a used custom-built carbon-frame Norco Valence. (I sold the cute Felt tri-bike to a friend to help fund the upgrade.) And gradually I’ve kitted myself out with a bunch of other stuff that makes cycling even more fun, comfortable and enjoyable. I now have multiple sets of bibshorts, real road-biking shoes, a smart little Wahoo Bolt cycling computer mounted on my handlebars, an under-seat bag of tools and parts, prescrption cycling sunglasses and a couple of nice jackets for wind and rain protection. I ordered a fair bit of stuff from AliExpress, so it hasn’t been insanely expensive. Rather than paying close to $200 for a pair of bibshorts for example I’m paying $25. Since I ride several days in a row, and they’re worn without undergarments during a wickedly-sweaty activity, I need 5 or 6 pairs to avoid having to do laundry every night and to ensure that when I do run a load of sportswear laundry, I have an extra pair while the rest are hang-drying their thick gel-chamois. I’ve also discovered Nuu-Muu dresses which I love for outdoor rides (indoors I’m less modest) … and they work for almost anything: music performances, XC skiing, running, casual wear. They aren’t cheap, but I’ve gradually accumulated a collection. I also built myself a rocker plate for my indoor trainer. 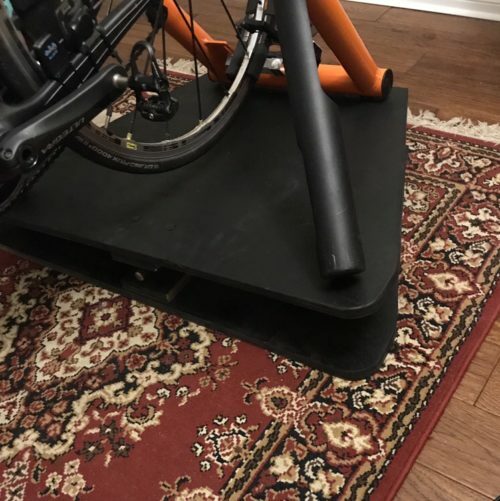 Since I’m putting 6000+ kilometres a year on my indoor trainer, I was persuaded by the rocker-plate aficionados in the Zwift community that from a comfort, realism and frame-strain standpoint allowing bike and trainer to sway just a little side to side like when it’s is being ridden outdoors was a good thing. I braved the lumber yard on my own, tied some decent rope knots to get two half-sheets of plywood home on the roof of my little Subaru, ordered pillow bearings (yeah, I had no idea what they were either until I started this) and sourced a hardened steel rod, and then set to work in the basement of the Nelson place with just a jigsaw and a hand drill. After a quick trip to Walmart for truck-bed spray paint and two playground balls, it was done. I’m pretty pleased with how it feels: it’s definitely more comfortable and realistic, something I appreciate for rides of more than an hour. On an even more exciting note, the geeky Canadian engineers who invented and produced my Stac bike trainer have come up with an upgrade that will convert it to a controllable trainer. This is the feature that most Zwifters swear by. It means that when the virtual world presents you with a hill, the trainer automatically increases resistance proportionally, and the experience becomes, as they say, “truly immersive.” They tell me there is no going back once you’ve ridden a controllable trainer. They say Zwift (which I love as-is, as you might have guessed, even though all that happens when my avatar hits a hill is that her speed drops dramatically) is nothing without a controllable trainer. So I am really excited. I’ve pre-ordered the upgrade, and it should arrive sometime in the summer or early fall. Throughout the past two winters I’ve also been XC skiing regularly, having bought a season pass at the club just outside of Nelson. Finally, after more than 20 years of wishing, I found some cheap (ex-rental) skate-ski gear and did a set of beginner skate-ski technique clinics. I still ski classic when terrain and conditions are more conducive to that style, but I do love skate-skiing. I’m not all that good at it yet, though I feel like the latter half of this season I’ve made some real progress. But I do love it! The feeling is so flowy and enjoyable. Hello “spring!” Is it time for shorts yet? So, running. My knee, which flared up for no particular reason in November 2016, had basically stopped me from running entirely by January 2017. The focus on cycling was an effort to deal with my grief and frustration over that reality. I finally went and saw the sports med doc in September and the verdict was as expected: age-related wear and tear with probably a bit of cartilage damage that might or might not get better spontaneously but wasn’t likely to benefit from arthroscopy (thankfully the big study that cast arthroscopy out of favour for knees like mine had just been published). So I pretty much stopped running. Maybe once every week or two I’d do an easy 5k, but the knee was always a bit sore and swollen for a couple of days afterward. I knew it would be foolish to do more. Wonder of wonders, I think my knee is okay! Not perfect, but much improved, such that I can run regularly again. With winter abating I’ve gone out and run my old route near home recently and I’ve been pleasantly surprised by how fast I am. 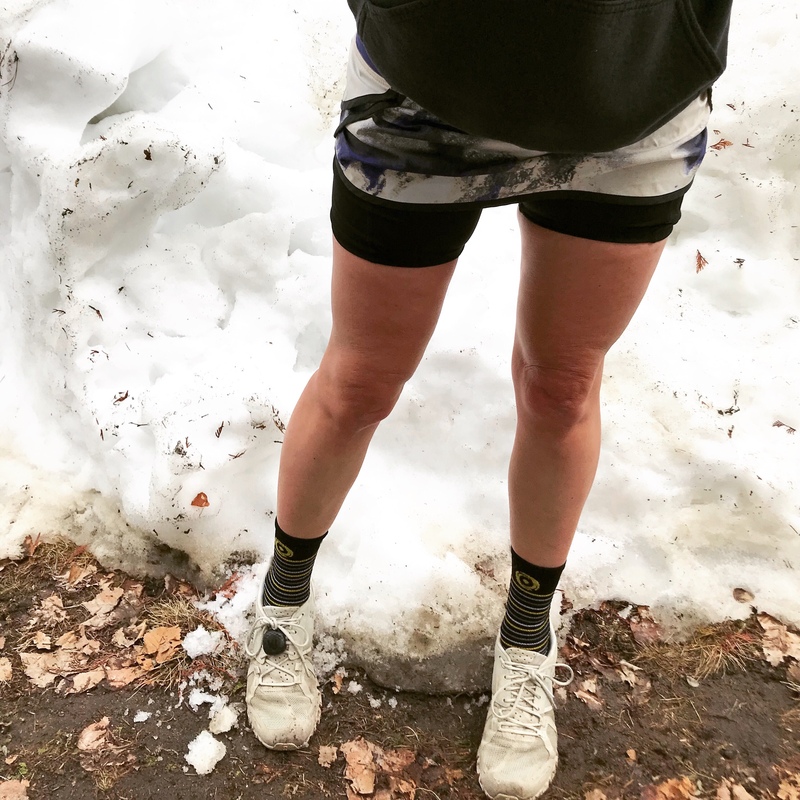 Without even pushing myself hard I have bested two of the times I set during the months I was training for the Vancouver Marathon that qualified me for Boston, when I was, I thought, in the best running shape of my life. So maybe there’s hope that I can be a runner again, rather than an ex-runner. I love cycling too much to give it up so I imagine I’ll just mix the two. ← Will school ever be the whole story?